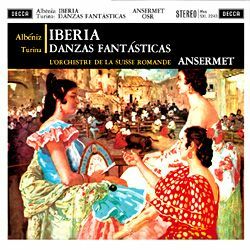 As in numerous other works by Spanish composers, Isaac Albeniz’s aim in his Iberia Suite was to portray the landscape and express the zest for life which is so abundant in southern countries. Infused with folk music elements, the suite is introduced by the dance like Evocacion which vividly evokes a picture of Iberia. The lush, extravagant harmonies and the stark contrasts of the dynamics in particular – from the softest pianissimo to the extreme fortissimo – certainly whet one’s appetite. Don’t worry – Spain has a lot to offer! The next movement, El Corpus en Sevilla transports us to Andalusia where a solemn procession is taking place to celebrate the feast of Corpus Christi. This is followed by a sparkling Triana in which the various complex and brilliant rhythms of the national dances Almer¡a, Ronde¤a and Fandango are ingeniously combined. And the two movements El puerto and El Albaic¡n are no less exciting: the first presents a rich potpourri of types of Spanish songs, while the second – held in the minor key – conjures up a picture of Granada’s gypsy quarter. Turina’s Danzas fant sticas are noted for their sumptuous orchestration and marked rhythms. A better choice to round off this first-class recording, dedicated to Spanish tradition, is almost impossible to imagine. The lacquers are cut in London – the home office of DECCA – by Tony Hawkins and Paschal Byrne using the Neumann VMS 80 cutting lathe. The tape machine employed is a Studer A 80 with analogue delay.